Strikeforce heavyweight champ Alistair Overeem has been calling for a shot at Fedor Emelianenko for quite some time. Overeem claims Team Fedor is using his alleged steroid abuse as an excuse not to fight him, however Emelianenko’s manager, Vadim Finkelchtein, states that’s not the case at all. Overeem is among many in the sport that believe M-1 Global, the Russian based organization that manages Fedor and is conveniently owned by Finkelchtein, has been protecting the heavyweight and his legacy by avoiding the planet’s true elite. Overeem will meet Brett Rogers at “Strikeforce St. Louis: Heavy Artillery” on May 15th. If he’s able to improve upon his 32-11 (1 N/C) professional record, it sets up a potential blockbuster scrap that could headline Strikeforce’s first pay-per-view broadcast rumored for late this year. Although Finkelchtein was intrigued by the scenario, he was quick to point out it wasn’t a certainty – particularly if you examine Overeem’s resume. “If you look at Alistair’s record, he has fought some good people. Some he’s won. Other fights, he has lost. But nothing in that record stands out and says that the next fight he has should be against Fedor,” he matter-of-factly said. 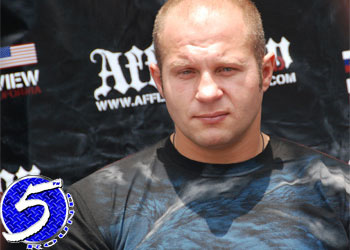 “The last three fights that Fedor has had have been against highly ranked fighters – very strong opponents. Emelianenko is hoping to return to action this summer against Fabricio Werdum, however Strikeforce and Team Fedor have been trying to “tweek” the original three-fight contract they agreed upon less than a year ago. Three months of back-and-forth negotiations have led to few answers and there appears to be no resolution in sight.